Large rosette of flat fleshy green leaves, 15cm stems with sprays of many small flowers within a range of white, orange, pink to reddish-mauve - pot luck until they flower in early summer. They dislike very alkaline soil and prefer a well drained neutral to acid. Plant at an angle, on a slope, between two rocks or grow out of a planting pocket in a wall. 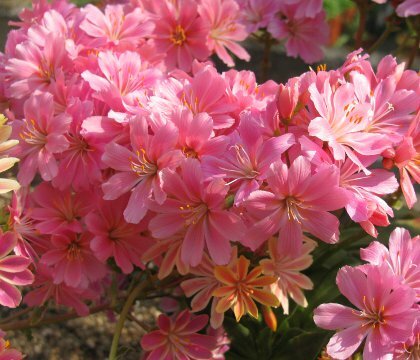 Can also be cultivated in pots in a greenhouse or frame. Large plants supplied in 12cm pots.